This album is a collection of original instrumental melodies of relaxing and soothing piano and keyboard music -- all composed by Dave Combs, including the popular, Rachel's Song instrumental. 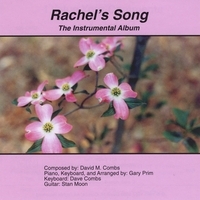 Rachel's Song - The Instrumental Album contains the first seven songs composed by Dave Combs and performed primarily by Gary Prim. These songs feature the perfect blend of electronic and acoustic instruments, principally the grand piano. The simple, yet hauntingly beautiful and deeply moving Rachel's Song is rapidly becoming a standard. This inspirational and soothing recording is as refreshing to listen to the one hundredth time as it is the first. Rachel's Song was the first song ever written by Dave Combs and this album was his first.